Last night I had friends over for movie night. No one had any good DVD offerings so we ended up watching the 1976 film "Network" instantly on Netflix. 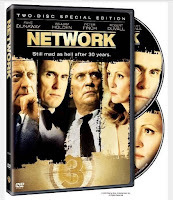 Network easily makes my list of top ten films. I even sampled some of its dialog for my 1998 CD Slice. Howard Beale is a newsman whose mental breakdown is inadvertently televised. The network initially fires him but then gives him his own TV show once it is evident that his psychotic rantings and ravings generate high ratings. Faye Dunaway plays Diana, an uptight, ruthless programming vice president whose pet project is developing a TV series to broadcast the terrorist activities of a black militant group. She also monitors the success of Beale's sermons, and is thrilled when Americans across the country open their windows and scream "I'm mad as hell and I'm not going to take it anymore!!!" at the urging of a frenzied Beale. There are no nations; there are no peoples. There are no Russians. There are no Arabs. There is no third world. There is no west. There is only one holistic system of systems; one vast interwoven, interacting, multivariate multinational dominion of dollars. Petrodollars, electrodollars, reichmarks, rubles, rin, pounds and shekels. It is the international system of currency that determines the totality of life on this planet. That is the natural order of things today. That is the atomic, subatomic and galactic structure of things today. It is the international system of currency that determines the totality of life on this planet. That is the natural order of things. You have meddled with the primal forces of nature, and you will atone! Am I getting through to you, Mr. Beale? You get up on your little twenty-one inch screen and howl about America and Democracy. There is no America. There is no democracy. There is only IBM and ITT and AT &T and Dupont, Dow, Union Carbide and Exxon. Those are the nations of the world today. Even though its portrayal of the dire consequences of corporate media ownership has been eclipsed by reality, Network still holds up well 32 years later.